Footprints in the Butter: Do I teach? Or do I clean? That is the question. Do I teach? Or do I clean? That is the question. Okay, so I pride myself on keeping it real. Which means that as much as I do NOT want to post on this week's Blog Cruise, I simply must. This week's question: How do you divide household duties and needs with your homeschool schedule? I want to tell you that I have this all figured out. I want to tell you that I have some fancy-schmancy schedule. And I have had that. Getting up in the morning and spending 5 minutes per room, straightening up, half an hour later, my entire house is pretty decent. I used to be that woman. Even as a homeschooler. I'm not that woman anymore. 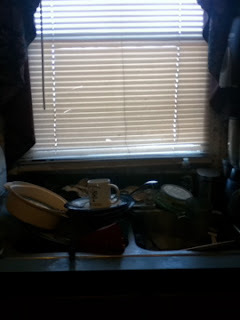 Okay, so I took a picture of my kitchen sink this morning. I cannot believe I'm posting this. How do I divide household duties and needs with my homeschool schedule? Obviously -- I don't. I don't do a very good job of dividing household duties and homeschooling. I can homeschool well. Or I can clean my house. Well, I think I can clean my house. It has been too long, and I'm not exactly certain anymore. It doesn't help that our dishwasher broke in December. December of 2009, that is. I did better when I had a dishwasher. Well, my desk was rarely better. Why am I posting this? Because we live in this house, we make a huge mess of this house, and homeschooling five children is a lot of work. Yes, they can help. Yes, they do help. But dishes keep stacking up, papers and books keep piling up, laundry keeps piling up, and probably because a clean house isn't something that is critically important to me, the schooling is what gets the priority. In my defense, by the end of the week, my sink is usually clean. And it gets nightmarish again over the weekend. Pretty much no matter what. That sink was completely clean on Saturday. I don't know how it happens. You don't have to have it all together to be a successful homeschooler. And if an immaculate house is important to you, you'll still find the time for it. For me, getting a chance to read a novel ranks higher. So the dishes wait. And wait. Check out the TOS Crew Blog on Tuesday for more ideas from moms who do have it figured out! Love it~THANKS for your honesty~AND I relate~but I did have a thought: THANK GOD for paper plates...LOL I USE them regularly! LOL!! Bless you and this was a fun topic! ;-)) HUGS!! Um, when did you sneak a camera into my house and take pictures? 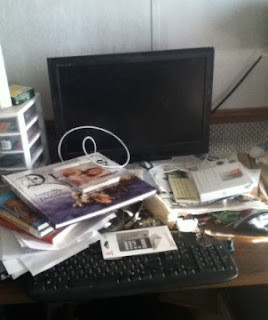 Oh wait.. the window looks a little different and my desk has WAY MORE junk piled on it. Our houses don't stay clean because we're HOME. I'm sure my house (or at least that's my fantasy thank you very much) would be much cleaner if I sent the girls to school. LOL, Debra! My desk looks far worse than yours, though at the moment my sink does look better. But I DO have a working dishwasher!